This paper considers actual problems and challenges within the whole quality profession and in today's quality management and quality assurance realizations in organizations. Problems are exemplified with the recent development of the quality related international standardization and usage of the standards. Also changed business environments give birth to new problems but also to new opportunities. The paper brings forward how to respond to these situations especially regarding to quality management in knowledge-intensive organizations (in fact all organizations are today very strongly knowledge-intensive). The paper presents possibilities for practical and beneficial applications of new principles, tools and organization-infrastructures for development of business-integrated quality management especially based on information and knowledge work environments in organizations applying disruptive IT (understood as Interactive Technology) innovations. Topics presented are new breakthrough ideas compared to typical current organizational applications and researches in the field of quality management and assurance. Ideas presented may be implemented into all kinds of organizations. Very new issue is to give guidance how to apply the newest Web 2.0 (O'Reilly, 2005) solutions for quality management. Consideration of problems and challenges of new business environments may help organizations avoid or repeat pitfalls in their quality development. The paper may also be seen as a source of ideas for interesting and significant future research topics. The situational knowledge for the paper is based on world-wide observations by the author through collaboration with many different contexts, organizations and expert networks. The paper provides viewpoints of an industrial practitioner knowing by experience real difficulties and possibilities in organizations (see e.g. Anttila, 2008b). Recognized researchers have been referred for the links to sound theoretical foundations. - Business leaders are not involved or committed in quality development, it is only a specialist issue. One reason is that business leaders are very busy people (Anttila, Kajava & Pirnes, 2007) and not deeply aware of highly specialized and complicated areas of business management (Anttila, 2007; Anttila, Savola, Kajava, Lindfors & Röning, 2007) like today's quality management and quality assurance. - Communication between business managers and quality experts is not easily effective because their roles and positions are so different. Business leaders know right things and experts know the means to do things right. Business leaders are generalists and strongly acting individuals with governing organizational positions. Experts are specialists and deeply knowing individuals with low position-based authority. - There are many different, distinct, and competing quality methodologies on which even quality experts don't share the same opinions. Examples include ISO 9000 standards (both ISO 9004 and ISO 9001), performance excellence models (quality awards criteria), SixSigma methodology, lean management practices, maturity models (SEI, 2007), balanced scorecards, business process management (BPM), business process reengineering (BPR), ITIL practices (Information Technology Infrastructure Library) (OGC, 2006), etc. - There are many other specialized managerial initiatives in organizations competing with quality development e.g. relating to finance management, corporate governance, business risks management, human resource development, knowledge management, information and security management, occupational health and safety, environmental protection, innovation management, ethical management, etc. - Quality initiatives in organizations are certification-emphasized, not for enhancing real business performance. Third-party "quality system" certifications are commercialized and lost their credibility. - Formal documentation is highlighted instead of a comprehensive management and application of business information and knowledge. - Quality implementations don't take effectively into account realities of modern business environments that relate to aspects of time, speed, agility, networking, complexity, tacit knowledge, and informal learning and innovation (El-Meligy & Anttila, 2008). In many cases quality development has not redeemed its promises indisputably. ISO 9000 standards have already a long history and strong impact - in both good and bad - on the development of quality cultures globally (Anttila, 1999). The international standards family of quality management consists of many different kinds of documents prepared by the international ISO/TC 176 committee and some other sector specific standardization committees. Now the fifth generation of ISO 9000 basic standards is under consideration, and the last published versions of the standards are ISO 9001 published in 2008 and ISO 9004 published in 2009 (ISO, 2008; ISO, 2009). - There is stagnation in the development of ISO 9001 standard. Factually there has been no essential development during the recent 15 years in the standard and no remarkable change is expected during the next few years. However, organizational business environments and communities are changing at increasing pace. - Standard ISO 9004 is too general, vague, and customary and therefore hardly can provide any practical guidance or support for organizations' business development. There is better other literature available for this purpose. Assessment model in the standard is theoretical and does not reflect needs of organizations. It cannot compete with recognized performance excellence models (quality awards criteria). Still after many years there is a great uncertainty and disagreement about the role of ISO 9004 standard. - ISO 9000 standardization process is too slow, mainly based on voluntary resources and ineffective consensus practice, and it is poorly managed and cannot follow the general development and trends of business environments and society at large. - Standardization bodies have very weak means to control use of standards. Use of standards is directed strongly by commercial consulting and certification business but not by genuine business needs. Problems in developing and using recognized standards of quality management promote quality to lose its genuine attraction and interestingness. This also creates disappointments towards quality professionalism. Commercialized certification business based on stagnant ISO 9001 has endangered diversity and innovation in quality management in organizations. There is threat to future of the whole management and ISO 9000 standardization. Although ISO 9000 standards are most well-known and used reference for organizations' quality development, many of the users are not aware of the related problems and their reasons. - Organizations are operating in emergent and self-organizing business networks that cannot be managed as a whole. There are also hostile actors in networks (Krebs, 2007). - Simultaneously there are requirements for agility and maturity (Agile, 2001; SEI, 2007). - Significance of immaterial issues (information, knowledge, services) is greater than of material issues (Davis & Mayer,1998). - People live, operate and learn in informal social networks where especially connectivity, interactivity and sharing knowledge are crucial factors for success (Downes, 2007; Siemens, 2004; Cross, 2003). - Internet is an important part of society and business globally (Levine, Locke, Searls & Weinberger, 1999; Anttila, 2002). - Transaction phenomena and the cost of transactions are key aspect for forming business organizations and arrangements (Coase, 1937; Anttila, 2002). - Increased speed of activities and change are prerequisites for all business (Anttila, 2004; El-Meligy & Anttila, 2008). - Employees and business leaders are under immense pressure and stress (Anttila, Kajava & Pirnes, 2007). These changed business environments have remarkable effects on management solutions in all organizations and therefore they must also be taken into account in modern quality management. There are many organizational cases of coping and feeling satisfactory with certain theories, principles, techniques and methodology of quality that are being tried or used distinctly. Examples include usages of ISO 9000, quality awards criteria or SixSigma. In many cases major achieved benefits are not necessarily caused by those particular methodologies but mainly by decisive and active management by using any systematic methodology. A well-known example is General Electric Company, SixSigma and Jack Welch (Welch, 2005). However, there is an expanding critical discussion about the prevalent approaches of quality discipline and presenting needs for change. Particularly central issue that has emphasized by all recognized references is how to integrate quality measures with business management and to take into account relevant business environments (ISO, 2008a; NIST, 2007). - Degreasing the use of concept "quality management (system)" from the core standard ISO 9004 of the ISO 9000 standards series and replacing it by "business management (system)". There is a broad unanimousness that quality management equals with quality of management instead of old minded management of quality (ISO, 2008a). The mew concept that is coming to discussions in this context is ecosystem. Figure 1 shows findings from the survey's area 2 of table 1. This includes results from 512 persons, different kinds of organizations and about 30 countries. Figure 1. Results from survey of committee ISO TC 176/SC3. 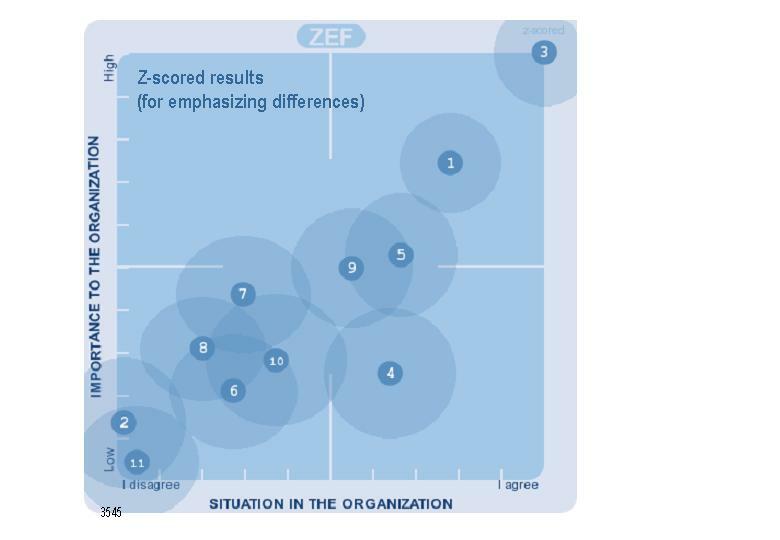 ZEF (Z-scored Electronic Feedback) methodology and on-line tool was used in the survey (ZEF, 2008). Here the results of question area 2 (numbers are explained in table 1) as Z-scored transformed form (Hoffman, 2008) in order to emphasize differences between different items. Numbers represent average values and ellipses standard deviations in responses. According to survey results all the aspects of Table 1 were very relevant, important and even critical in the business of participated organizations. Organizations had already done some measures to take them into account in developing their management practices. However, general awareness and methodological support available for this was rather little. Management standards and other references supporting management development were used fairly much among the organizations. However, according to the respondents those materials don't support strongly application of time, speed & agility and related aspects in their managerial solutions. 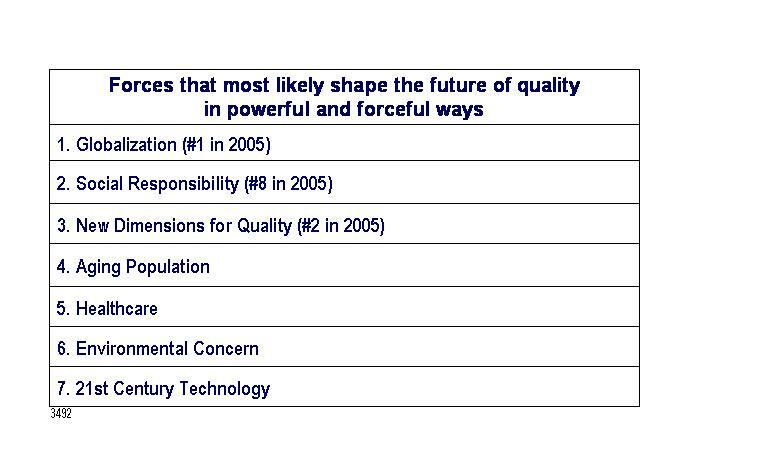 American Society for Quality (ASQ, 2008) has very recently carried out its fifth Futures Study with a group of circa 100 international experts in the field to provide understanding of the forces that would shape the future of quality (Table 2). The next ASQ Futures Study is being done in 2011. Table 2. Summary of the results from Delphi study carried out by the American Society for Quality (ASQ, 2008): "No boundaries  The old boundaries have been obliterated." Scoring figures represent relative support to the topics got from the participated experts. One may draw conclusion from the ASQ study (Table 2) that those traditional and prevalent solutions of quality management that are based on narrow quality management approaches, quality realizations within restricted organizational scopes only and mass production should be replaced by global, human related and societal measures utilizing innovations and new technology and impacted by new markets' power and individual needs and expectations. - Which customer needs are fulfilled? - How is value created for customer? - How do firms make money? - How are technologies used and resources utilized? - How do firms co-operate? - How to define architectures, orchestration? - How to concretize the service production and provisioning? All these studies and observations reveal the importance of information and knowledge and new challenges related technologies. Organization's quality management system means quality of management that is carried out in a systematic way and covers the whole organization. Success in management is based on right business related knowledge and management skills to use knowledge on time effectively and efficiently for current business needs. Business leaders also need in their daily tasks a lot of very specialized knowledge and information. The essence of quality management is to manage organizational resources and operations by relevant information and knowledge. Needs of using information have been increased overwhelmingly within all kinds of organizations, their management systems, business processes, and relationships with stakeholders (Anttila, 2002). An organization needs to share information and knowledge among its managers, employees, and people of stakeholders. In order to manage situation, organizations have invested in IT solutions. However, development and use of IT solutions has been problematic in practice. During past years many IT applications have made jobs of people more complex and difficult, rather than simplifying their work (Collins, 2001). Portal (Collins, 2001) is a modern solution for knowledge-content businesses and seen as a solution to chaotic information situation in organizations. Negative point is that portals are expensive and complicated to create and maintain and suitable mainly for big organizations. - McKinsey: Over 80% of enterprises plan to use Web 2.0 technologies for better interactions with customers, partners and employees. - The Wall Street Journal: About 20% of companies use mashups in one form or another and, mashups will become so intuitive that non-technology users will be building them. - Economist: Serious business: A perspective on Enterprise Web 2.0, and how Web 2.0 goes corporate and organizations are taking advantage of it. - IDC: The hidden costs of information work: Information tasks are central to today's organizations, and organizations that give information workers adaptive, enabling technology can gain great competitive advantage. - BusinessWeek: When companies do the mash. Corporations are jumping onboard the trend of mixing and matching information from different sources. Solutions should be made individually in each organization or business community. Table 3 presents one example for an organization's modern networking strategy (McDonnald, 2007). Based on Web 2.0 principles and tools we have developed company-dedicated solutions to support companies' managerial quality activities. Solutions are built as management Knowledge Work Environments (KWE) (Anttila, 2008a; Anttila, 2006) and used as online Web service by "Software-as-a-Service" (SaaS Resource Center, 2008). Figure 2 shows how KWE tools are available at the user interface of the system for collaborative activities of management processes. Especially strategic management is strongly a knowledge-based collaborative and innovative activity where typically organization's board of directors, executing managers, selected experts, personnel representatives, and stakeholders' representatives may be involved. Its purpose is to strive for enhancing overall business performance of an organization for better competitiveness and success. Strategic management consists particularly of organizational change management. However, simultaneously also organization's current business results should be ensured as a whole as planned. The principle is that KWE's wiki covers organization's whole business. Wiki includes access to the following main business management elements: Corporate business foundations, business processes, managerial tools, business information, stakeholders and business results. Quality assurance refers to measures with which a supplier strives for getting its customer-organizations or other stakeholders convinced of the fact that requirements pertaining to products are met and that the supplier has reasonable abilities for that. There are many possible solutions for establishing quality assurance but the essence of a good quality assurance is always an effective communication between organization and each of stakeholders. Third party certifications have lost their credibility as an effective solution for quality assurance (Anttila, 2008d). There are continually business actions between organizations and their stakeholders that reciprocally influence each other. Added value to the parties is created by these transactions, but there are always also involved transaction costs (Coase, 1937). Increasing communication effectiveness is a great challenge to development of principles and practices for supplier relationship. Use of Internet's possibilities and particularly Web 2.0 social media is a great challenge because the cost of individual transactions may be decreased to minimum and consequently one may increase the amount of transactions effectively. Internet may also give quite new possibilities for supplier and quality assurance communication, e.g. multilateral communication, real-time multimedia information, "e-certificate" solutions, collaborative social networking applications, and "Enterprise One-To-One solutions" (Peppers & Rogers, 1999). Confidence is most critical factor for success in cooperating between partnering organizations. It is also a competitive advantage because it is difficult to imitate a genuine confidence and to create it in a short term. Transparency is the core element for building confidence among cooperating organizations and individuals. Increased risks and uncertainties within the operational environment set raised requirements for confidence. Key measures for development of situation focus on effective communication solutions. - Integration: Organizations implement effective / efficient and business-relevant quality principles and methodology embedded within their normal business management infrastructures for both strategic management and operational management. Conceptually this means change from quality management (management of quality) to quality of management. - Responsiveness: Organizations enhance abilities to adjust quickly to suddenly altered external conditions, and to resume stable operation without undue delay that is based on dynamic and flexible business management. - Innovation: All quality realizations are organization-dedicated solutions. There is no single solution to organizations' challenges. Organizations strive continuously for new organization-dedicated innovative and unique approaches. Multiple different choices for quality management are encouraged in competitive business environments. That especially emphasizes change from standard approach to organization's own unique approach. - Collaboration: Communicating and working together with colleagues and appropriate knowledge communities appreciating connectivity, interactivity, and shared knowledge and resources. - Getting advantage of tacit knowledge instead of only records of explicit data and information and applying new revolutionary possibilities of today's interactive technology. Effective implementation of innovative organization-dedicated business-integrated quality management does not call for any extra measures or investments. Experiences have proved that it is always worthwhile to improve the existing management approach and practices of the organization based on a systematic methodology and organizational learning (Senge, Roberts, Ross & Kleiner, 1995; Anttila, 2008a). However, implementing new ideas requires courage from organizations to step out and stand out from the growing crowd of look-likes. New approaches are still more important in new dynamic business environments than in traditional business relationships. For quality management the organization must be always ready but never finished. There are lots of new principles, tools and infrastructure solutions available already now for organizations' quality of management development especially related to new interactive technology for managing organizational business information and knowledge. However, also additional research is needed especially for recognizing implications of new business change indicators and business models to the aims and purposes of quality management. 1. Agile Alliance, 2001. "Manifesto for agile software development". 3. Anttila, J., 2008b. "Business-integrated quality management - A Company case, an example of a long term development of quality integration". 4. Anttila, J., 2008c. "New principles, tools, and infrastructures for quality management in modern changed business environments". 5. Anttila, J. 2008d. "From supplier management to mutually beneficial partnership". 7. Anttila, J., 2006. "Modern approach of information society to knowledge work environment for management". 8. Anttila, J., 2004. "Quality management in networked and flexible organizations". 10. Anttila, J., 1999. "Getting ISO 9000 happened more efficiently without a quality system and third party certificates". ICPQR'99 Conference, Vaasa. 12. Anttila, J., Savola, R., Kajava, J., Lindfors, J. and Röning, J., 2007. "Fulfilling the needs for information security awareness and learning in information society". The 6th Annual Security Conference. Las Vegas. 16. Coase, R. 1937. "The Nature of the firm". 18. Cross, J., 2003. "Informal learning". 20. Downes, S., 2007. "Toward a new knowledge society". 22. Facebook, 2008. "About Facebook". 23. Gloor, P., 2004. "Knowledge flow optimation". 24. Hoffman, H. 2008. "Z-Score Explained". 26. ISO, 2008b. 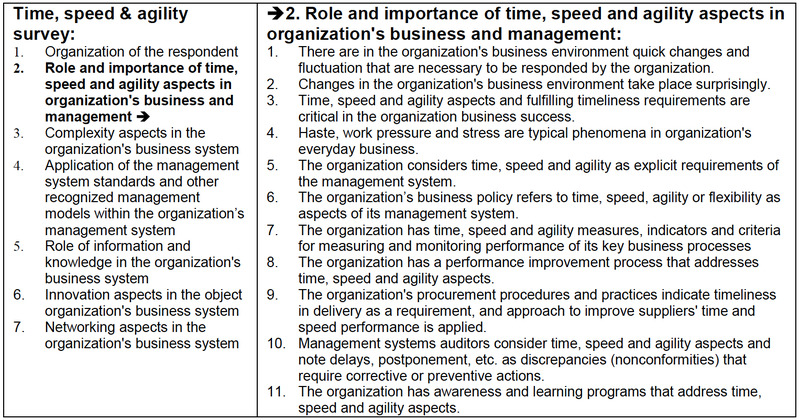 ISO TC 176/SC3, "Time, speed and agility. Questionaire for contributing to the management systems standardization". 30. ISO, 2005. "Next Steps in your journey to sustainable success / performance excellence". 31. JackBe Corporation, 2007. "Is your organization implementing Enterprise Web 2.0?" 33. Levine, Locke, Searls and Weinberger, 1999. "The Cluetrain Manifesto: The End of Business as Usual". 34. Merrill, D. 2006. "Mashups: The new breed of Web app". 35. McDonald, D., 2007. "How to develop a business-aligned social media & social networking strategy". 36. Naidoo, M., 2005. "I am because we are (A never ending story). The emergence of a living theory of inclusional and responsive practice", Bath. 39. Office of Government Commerce (OGC), 2006. "Best Practice portfolio: new contracts awarded for publishing and accreditation services". 40. O'Reilly, T. 2005. "What is web 2.0". 42. Pilgrim, M., 2002. "What is RSS". 43. Real Time Community, 2008. "Real-time economy for you and us". 48. Siemens, G., 2004. "Connectivism: A learning theory for the digital age". Software-as-a-Service (SaaS) Resource Center, 2008. "SaaS showplace". 49. Stacey, R. D., 2004. "Complex adaptive systems". 50. Tekes, 2008. GIGA Results Promotion AR4: "Business models". 51. ZEF Solutions, 2008. "Best evaluation results".